The Guinness Book of Records has a category listing the world's most fearless animal. The ferocious carnivore that holds the title has no problem with running up to a lion or leopard on a kill and driving it away. It also has a taste for snakes and routinely enjoys a cobra or other deadly serpent for lunch. Can you guess what it is? When you think of truly vicious animals, that is, animals that a whole host of other animals prefer not to tangle with, chances are good that you don't think of the honey badger. Actually, you probably don't think of one at all, since most people don't even know what a honey badger is, let alone have an image of it as the most fearless animal on the planet. A native of South Africa, Israel, India and other regions in South Asia, the honey badger resembles either a small wolverine or a large skunk, both wearing a really bad white toupee. This critter, also known by the Afrikanner name of Ratel, is so tough that a division of the South African army has named a heavily armored troop carrier after it. The honey badger is one nasty creature, with a reputation for being so fierce that it doesn't often take no for an answer, even when it's a much larger predator holding onto food that the badger wants. It constantly forages for food and eats just about anything from fruits and vegetables to mice, scorpions, gazelles, and small crocodiles. Looking for food or not, it will attack just about anything that gets in its way, including buffalo, lions and other big cats, people and vehicles. The honey badger is totally without fear. So what makes this member of the weasel family so tough? After all, the average male honey badger weighs in at only about 30 pounds and females tip the scales at something around 15 pounds. Well, for one thing is has a tough rubbery hide that is exceptionally loose-fitting. A larger animal fighting with a honey badger finds it difficult to inflict a serious bite into flesh, muscle or bones. Because the hide is so loose, the badger is quite difficult to hold on to firmly and can easily maneuver into position to inflict horrible damage to its opponent. The honey badger has powerful jaws and strong teeth capable of crunching through fur, muscle and bones. Its front legs are really strong and equipped with inch-and-a-half long claws that are excellent for digging into snake holes or horribly slashing and tearing up opponents. There is one other thing that makes the honey badger a truly bad character to fight against. Rumor and tribal lore have it that this deadly carnivore is something of an oddity in the animal world. 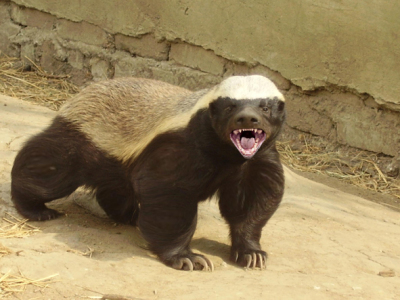 The honey badger is what would be described in people terms as a dirty fighter and supposedly has been observed "hitting below the belt" on more than one occasion. Evidently, when a honey badger is grabbed by a much larger predator, the badger's opponent had best be prepared to cover up down below. Taking advantage of its loose skin to twist and turn, the badger likes to maneuver into position where it can tear off its opponent's scrotum. This has the effect of causing blood loss and undoubtedly more than a little shock to the other animal when it realizes what just happened. What's on the menu for the world's most fearless animal? Everything. But honey badgers absolutely favor snakes, including black mambas and some of the world's other most deadly reptiles. By some estimates snakes make up half of the honey badger's diet. One video showing a montage of a honey badger capturing its favorite prey shows it going to the very top of a tree and ripping a cobra out of the branches. The same video shows a badger stealing a rat right out of the mouth of a puff adder. The surprised snake simply remains where it is, glaring at the honey badger lying just a few feet away as it scarfs down the rat. With the rat as an appetizer, the honey badger decides not to let a perfectly good puff adder dinner go to waste and it attacks the snake. A few words about a puff adder. This thick-bodied, slow-crawling, bad-tempered viper doesn't have the most powerful venom in the snake world. What it does have are some of the largest fangs in all of snakedom and they are capable of delivering a massive dose of venom with what is indisputably the fastest strike of all venomous reptiles. An untreated bite from this snake usually results in unconsciousness followed by death in about 28 hours, or less. It is the one snake in Africa responsible for more human deaths than any other, probably because it is so widely distributed and because of the amount of venom it delivers with a single bite. When the honey badger attacks the puff adder in the video, the snake strikes the badger squarely on the face, injecting enough venom to bring down a number of animals larger than the honey badger. The badger responds by biting off the snake's head and consuming part of the body ... before collapsing into a state of unconsciousness. A couple of hours later the badger suddenly wakes up , shakes itself, wobbles groggily over to what is left of the snake and finishes its meal. The honey badger also has a fondness for honeybee larvae and that's the only thing sweet about its disposition. It's even been known to tear into a hive of African Honey Bees, the aggressive bees that have earned the nickname Killer Bees because they have attacked and killed people. How is is able to endure the stings of Killer Bees and bites of venomous reptiles? This is something that is not known for certain but some theories speculate that these tough little animals develop an immunity to various toxins over a certain period and that even evolution may be playing some kind of role, in that regard. Honey badgers have no known predators. That doesn't mean that they don't fall victim to lions, leopards and hyenas. A bite to the head by any of these powerful predators will quickly dispatch a honey badger, as it will with many other animals. And, because of their fondness for the contents of beehives, honey badgers are regularly trapped, shot or poisoned by beekeepers. The honey badger is one nasty animal, totally without fear, and ready and willing to fight just about anything, any time. And, if you're a male opponent going up against one of these bad boys, you may want to pay attention to the rumor mill and play it safe. Consider wearing a cup. A metal one.